Not a Holmes story, but I think this still falls under our charter of "cases for which the world was not yet prepared." 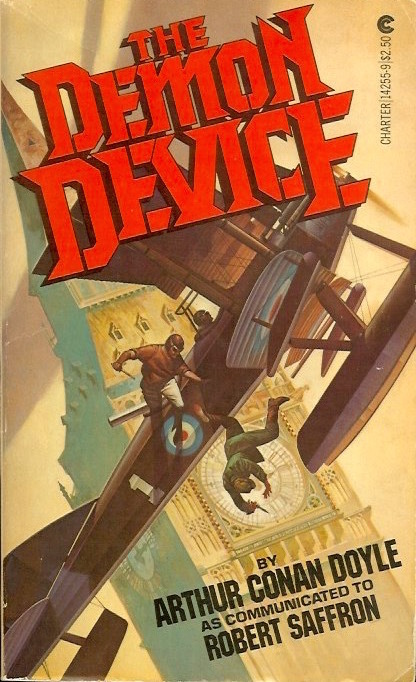 The Demon Device features Sir Arthur Conan Doyle himself in action. First published in 1979, this beautiful 1981 Charter paperback sports sensational cover art and is illustrated throughout. The time is World War I. The British government discovers the Germans are developing a deadly new secret weapon. Someone must be sent to find and destroy it and who would be a better candidate than Arthur Conan Doyle. Doyle is a six-foot-two, two-hundered-pound giant, and expert balloonist, boxer and airplane pilot. And he certainly can solve a ride as well as his fictional hero. But his abilities are sorely tested by the dizzying kaleidoscope of perils he finds behind enemy lines. And his prudish Victorian morality is stretched to the breaking point by the tempestuous I.A., a mysterious, dazzling beauty with very clear ideas on how she can help the embattled Doyle.